A premium hessian sheet for protecting mortar, new brickwork, concrete curing and general pr..
Hessian roll is a great material to cover concrete and brics to help protect them from the frost. If concrete or bricks are not covered in the cold weather then the quality of the product could be deficient The hessian roll is biodegradable and is available in two lengths, 46m and 91m. It can be rolled out on site and cut to size. 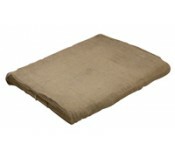 The width of the hessian is either 1.37m (46m roll) or 1.83m (91m roll).